Caliber 7,62mm NATO (5.56x45mm NATO with Mini-SS kit installed) Weigth 9,6 kg on bipod (8.26 kg in Mini-SS configuration) Length 1155 mm (1000 mm Mini-SS) Length of barrel 550 mm (515 mm Mini-SS) Feeding 100 or 200 rounds belt Rate of fire 600-900 rpm Due to international sanctions against the Apartheide regime of South Africa, the South African Army had several needs to develop small arms by itself. 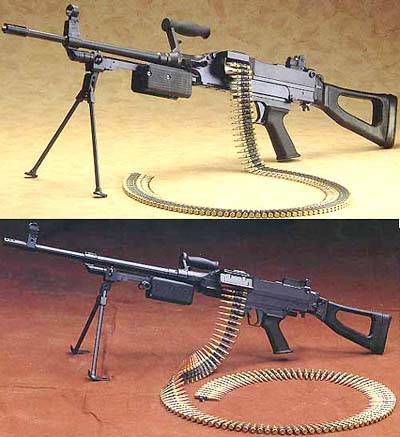 In the 1977, the development of the new universal machine gun began. The issue of the new MG began in 1986, and it was named SS-77 (SS for the designers - Smith and Soregi, and 77 - for the year the development began). The SS-77 is a gas operated, belt feed weapon that fires from open bolt and has breech block swinging sideways to lock into the receiver wall. It had quick changeable barrel with external longitudal flutes to reduce weight and improve cooling. The SS-77 was developed to fire 7.62x51mm NATO ammunition, but when need for smaller caliber MG was recognised, the Mini-SS kits were developed in 1994 to convert any SS-77 to fire 5.56x45mm NATO ammunition. These kits consist of new barrel, bolt, gas piston, feed cover and some other small parts, and with these kits the SS could be converted from one chambering to another in the matter of minutes. It should be noted that according to some experts the SS-77 is one of the words best universal machinegus, along with Belgian MAG-58, Russian PKM and German MG-3.